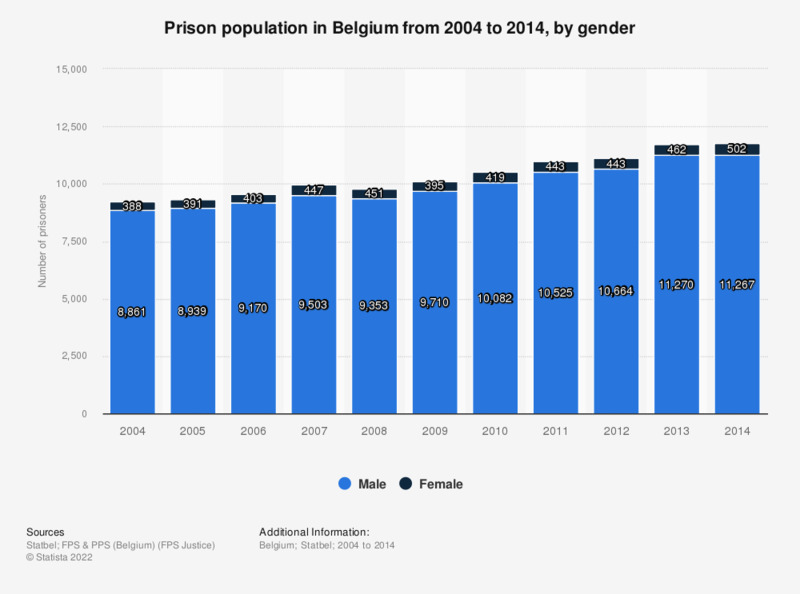 This statistic displays the prison population in Belgium from 2004 to 2014, by gender. In 2014, approximately 11 thousand prisoners in Belgium were male and about 500 prisoners in Belgium were female. Statistics Belgium states that the figures represent the population and capacity on March 1 every year, and capacity changes over the year due to renovations. The capacity for limited detention (meaning that the prisoner can leave the prison during the day for the period that is necessary to fulfill his activity to improve reintegration possibilities) is not included in the figures. The figures for the prison population exclude the population of the institutions in Tournai (Doornik) and Mons (Bergen).